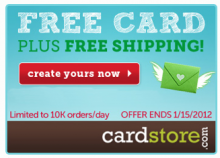 Have you shopped at Cardstore.com yet? If not, here’s a great chance to find out how awesome they are. They have a huge selection of photo cards and gifts. Cardstore.com is offering 70% off EVERYTHING sitewide with code: BLACKFRI! They also offer FREE Stamps and FREE Shipping every day! Head over to Cardstore.com and check them out. This offer is limited to the first 100,000 people only. UPDATE: The offer is over! Wow that is fast but you can still get 40% off your total order with code: CSSAVE403 at checkout! Here’s another fun 11-11-11 deal! Head over to CardStore to get a greeting card for just $.11 with FREE shipping and stamps! This offer is limited to the first 111,111 orders. There is no coupon code required, just head over there now and check out this deal. I really wish I had our Christmas card photos ready, this is such a great deal!